Six years ago, Mr Freddy Yap was at "the lowest point" of his life. He slogged for long hours running his food-packaging business and wolfed down "rubbish food" such as fast food and economy rice meals - whichever was more convenient at odd hours. The 48-year-old recalls: "I hardly slept as I was constantly thinking about how to make more money. I grew up in poverty and was afraid of being poor again." The stress of the daily grind eventually took a toll on his health. On top of being on the brink of a burnout, he suffered from persistent coughing and had rashes on his body. In 2011, he decided enough was enough. He took a year-long sabbatical and moved across the Causeway to live with his relatives in the Pahang countryside. There, he had ample rest, took charge of his diet and regularly went on long nature walks. He also drank bird's nest soup almost every day as his cousin runs a bird's nest farm there. As he recovered from his ailments, he spotted a business opportunity. My favourite dishes of my mum's, such as fried turmeric pomfret with sambal, steamed pomfret with sour plum and ginger and ABC pork rib soup. He says: "The bird's nest industry is not regulated and information on the quality and cleanliness of the nests are based on what the sellers tell customers." A year later, he returned to Singapore and set up Superior, an online business selling mainly bird's nest and chia seed products. To ensure the cleanliness of the bird's nests, which are sourced from swiftlet houses in Malaysia, he implemented a rigorous cleaning process that has been certified by the global food safety management standard - Hazard Analysis and Critical Control Point. The process includes cleaning the bird's nests with distilled water and sterilising them with ultraviolet rays. Superior also runs chemical tests to ensure the nests are free of contaminants such as nitrates that are present in bird faeces. Mr Yap also sells a blend of five types of chia seeds that are sourced from Peru and Mexico. Instead of being milled, they are micro-sliced, which retains their nutritional properties. Chia seeds, which are rich in antioxidants, are known as a trendy "superfood", while bird's nest is an old-school wellness food. On his choice of products to sell, he says: "I am familiar with using both. I had smeared crushed chia seeds on my rashes, which helped to reduce the inflammation." These days, he avoids deep-fried food and gets his Omega-3 fatty acids by consuming chia seeds. Mr Yap is married to a 38-year-old who runs a spa and they have a five-year-old daughter. He also has a 16-year-old daughter and a 10 year-old son from a previous marriage. He says: "I still love my curry puffs and laksa. Food gives me the greatest enjoyment, so it is all about having a balance." What are your fondest memories of food? The few times that my mother cooked her signature fried turmeric pomfret with sambal. She cooked this only once or twice a year as we were poor. What are your favourite eating places here? 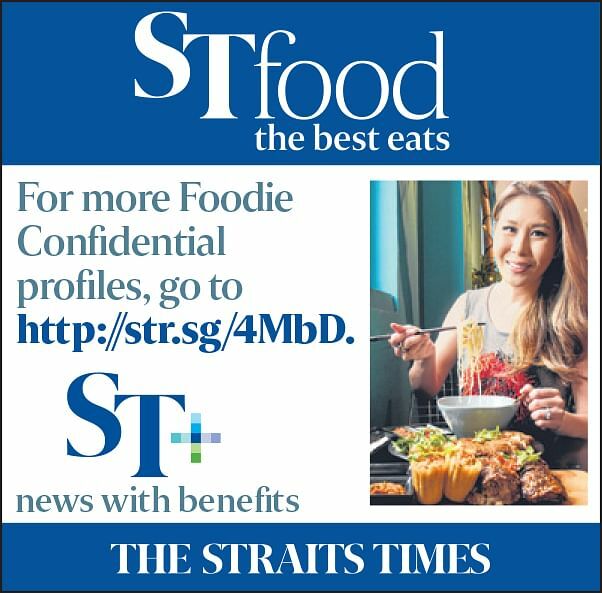 I have been visiting Katong Laksa in Telok Kurau Road for more than 20 years. I will drive all the way from Sengkang, where I live, just to savour a bowl. The laksa gravy is thick and rich and I can taste the dried shrimp in it. Another place I frequent is Xiang Signature Restaurant in Liang Seah Street, which serves Hunan cuisine. I always order the stir-fried cauliflower. The chef has good control of the heat, so the vegetables are soft yet crunchy. I also like the stir-fried frog leg in chilli, which wakes up my palate. I like Wild Rocket in Upper Wilkie Road, which serves food that is surprising and teases the palate, such as the char kway teow that tastes like fried noodles, but which consists of thinly sliced cuttlefish. A good piece of wagyu steak in a thick ribeye cut. I prefer to have it done medium so it is char-grilled on the outside and soft on the inside. When I am in Kuala Lumpur for work and have a steak craving, I drive to the Genting Highlands resort to dine at The Olive restaurant, which serves steak that has a melt-in-the-mouth texture. What is your favourite overseas food destination? I travel to Kuala Lumpur every two to three months. I go to Nadodi, an Indian restaurant. I like its egg kalaki with jujube fruit and fried chicken skin as the dish has a good mix of creaminess and crispiness. I also like Dewakan restaurant in Shah Alam, which uses Malaysian produce. My favourite dish there is the crispy kailan with fermented fish sauce. I have eaten horse meat in a steamboat meal in China. The meat is not as coarse as I had imagined. Do you have a dining quirk? I am particular about the freshness of food and drinks. I have sent back coffee that was overboiled, which gives a burnt taste, as well as stale oysters. On weekends, I like cooking fried rice with mixed vegetables, but I will use only cooked rice that has been left overnight as it has a firmer texture. I also like making ribeye and striploin steaks topped with a dash of teriyaki sauce. How do you consume bird's nest and chia seeds? I make a drink with honey and ground chia seed twice a day and have a bowl of bird's nest soup daily. I like to add bird's nest to vanilla ice cream and to Korean ginseng chicken, to add sweetness and give them a more velvety texture. If you could choose anyone to have a meal with, who would it be and why? I would like to have a meal with myself as I have spent so many years entertaining people over food for work and have not had the time to appreciate food.